No-one knows where it ends. 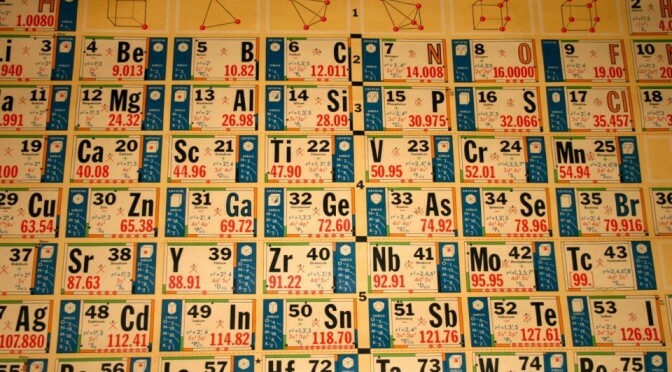 Where does the periodic table of elements end? The short answer is: no-one knows. We all know where it begins, with hydrogen, that wee plucky element consisting of only a single proton and one lonely electron. As we progress along the columns and rows (or spirals or pillars or facets of any of the myriad different versions) of the periodic table all we’re doing is adding protons, one at a time, along with a corresponding number of electrons and a bunch of neutrons to boot. Up we go through the non-metals, the noble gasses, the alkali metals, the actinides, lanthanides to the transition metals and beyond. Eventually we get to the limits of nature, somewhere around element 92, uranium. These are the elements that were created in the atomic factories of the universe: stellar cores and supernovae. But the periodic table doesn’t stop there. Beyond uranium, heavier elements are created through fleeting nuclear reactions – such as when a hulking uranium atom falls apart, flinging out neutrons willy nilly, one of which might be absorbed by a neighbouring uranium atom, which then decays into neptunium (element 93) and then into a shiny new atom of plutonium (element 94). But this doesn’t happen terribly often. Then again, all you need is a single atom of a new element in order to add another box to the periodic table. In the heady days of the mid-20th century, this got nuclear physicists thinking: how far can we push the boundaries of matter? How many elements might we be able to make? Over the decades they conducted experiment after experiment synthesising new “superheavy” elements and pushing the boundaries of the periodic table, not to mention of matter itself. To date, they’re up to element 117, and element 118 has been glimpsed, but has yet to be confirmed. Now it’s no trivial matter to make a superheavy element. To make element 117 the researchers needed to painstakingly create a hunk of highly radioactive berkelium-249 and bombard it with bucketloads of a rare isotope of calcium, Ca-48, in the hope a few atoms would stick together and fuse long enough to form element 117. Well, ten billion billion Ca-48 atoms later and they succeeded: they had built themselves a whole four atoms of element 117, and had a few milliseconds in which to admire them before they decayed away into atomic debris. Four atoms might not sound like much, but consider this: these elements are so rare and fleeting that they might not exist anywhere else in nature. In fact, they might be impossible to create even in the explosive atomic factory of a supernova. So it could well be the case that atoms of element 117 had never before appeared in our universe, and they can only exist in the labs of sentient beings like us. Think about that for a moment. Now four atoms might sound more like a triumph of cosmic proportions. Plus, it takes us one box closer to the end of matter, and the last box on the periodic table. Sounds a bit like making a dribble sand castle. By the way, was Ca-48 rare before or after they bombarded ten billion billion atoms worth of it at berkelium-249?